The importance of a trusted system to test, control and guarantee the cleanliness of US drinking water is in the headlines. There is significant concern over tainted water in Flint Michigan due to wrongful polluting and outdated piping networks that supply dangerous levels of lead contamination in the community’s drinking water. This issue is not isolated to just Flint, and unfortunately is prevalent in many regions of the US, in part due to lack of oversight, but also to faulty management tools. jQueryMaps has recently partnered with a company from Oregon to create a map software to plot drinking water test locations and via a custom admin tool, input and control ongoing tests. The tool is responsive, intuitive to use and supports the company’s current data for a seamless integration into their intranet. The potential of using these types of graphical tools with large data samples offer a solution to locate polluted water as a first step to curb the problem. The benefits of working with a visual tool to plot information are numerous, both to users and administrators of the software. Not only does a visual reference provide opportunities to create heat maps, but the map reference also enables better forecasting methods to gauge other water test sites. Existing data can be easily geocoded (assigned latitude and longitude values) based on the full address of the locations or the lat/lon information can be stored using a mapping platform or geocode tracker. The easiest method of doing this would be to carry a device (most smart phones have this enabled) to store the true position of a location when a test is conducted. The professional on the job can store this value at a click of the button and the lat/lon is saved to the system. These values are what allows information to automatically display on a map, exact to within a few feet. This is particularly important when the water testing site in question is a well or pipe located on private land, without an exact address. 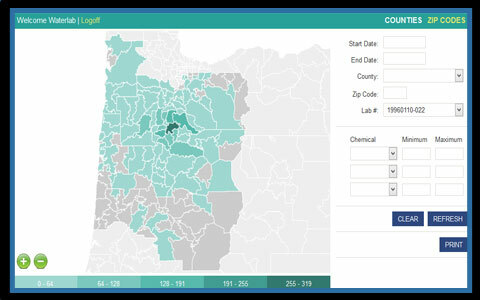 The map software used in the project recently developed by jQueryMaps is based on an analysis of chemicals in the water to determine the purity of drinking water supplies in the US Northwest. Samples of the water are taken to a laboratory and the results of the tests are then submitted to the software using an online admin tool outlined below. As each test is assigned a unique ID, it is easy to link the results to the lat/lon information and thereby georeference the location on the map. 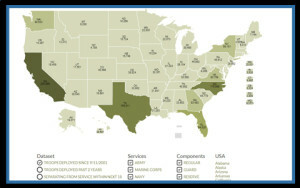 This simple process brings the final map results to life on the interactive map. When working with interactive data, it is possible to apply filters on the map to display results only by a selective category or by region. It is possible to use a simple drop-down filter and zip code search to only view water test results for a particular chemical in a particular region. This simplifies area-based analysis and forecasting of tendencies in test results. For example, maps can be paired with street-level overlays, such as OpenStreetMap using MapQuest topography to provide a nice combination of roadways with geographical characteristics of the area. Implementing these overlays on a jQuery Map is useful as the flow of water and the location of lakes and estuaries are of utmost importance. If a particular chemical count is higher than a standard amount, professionals can rely on a dynamic map to see a pattern in test results and then overlay topography and waterways to make forecasts for other regions that may be soon affected. This is especially important when mitigating the environmental damages that chemical spills can have on a water source. The task of managing input and editing of data becomes challenging when the responsibility is given to a team. This is a common situation as more than one individual may be participating in a project and would require access to the information. However, this necessity can also lead to concerns about data breaches, privacy and mistakes that can occur when server credentials are granted to groups. It may also be the case that the individuals heading the project are not able to or comfortable working on a server and making updates within a database. Most powerful map software tools work with some sort of database on the backend. At jQueryMaps we work with all major databases including MySQL, MS SQL Server, Oracle, MS Access, Sharepoint along with simple XML files or JSON data. All of the data and map software reside on the client’s servers providing full security behind your existing firewalls. These same benefits can also be challenging for companies that need to have updates made by a group, but are concerned granting access to the database, that in often cases drive other components of the website or company activity. To this end, jQueryMaps offers custom admin tools that can be developed to simplify the data entry process and bypass any technical requirements in addition to limiting actions that can be made within the database. An admin tool is a simple HTML page, or most often a series of pages, that are password protected. Each team member can be issued a unique username and password to access the admin. The tool as a standard is created to make new entries (such as data testing locations), edit entries (such as adding a new chemical or a test result for an existing location) or deleting locations (in the event a client is no longer active). This last option can be configured to simply change entries to inactive while keeping the data in the tables for future reference. As with any custom mapping project, all components of the admin can be tailored to your project and company’s requirements. The benefits of an admin are numerous. Not only does it allow teams to work in unison submitting new entries and managing changes in the data, but it most importantly circumvents the issue of requiring staff to have the technical knowledge and access to the database. 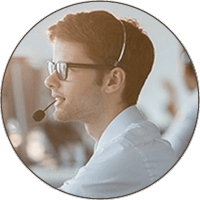 Any personnel granted a username and password would be able to view the admin and apply changes via simple fields and dropdowns, whose results are then saved to the database on the backend. Depending on the project requirements, all users could be provided the same access or there can be scaled tiers where deletion of information is only available to select users. Once the logic is created, the shifting status of any user is a simple change in the data. When considering using a map on your next team project, speak to one of our representatives to see how other companies have used admin tools. Contact us. Not all maps require street-level detail and when unnecessary, too much visual information can distract users from the main focus of the project. For example, if the purpose of the map is to show city locations where offices are located, it may be more useful to show an icon with a text label at the State level on an area-based map, rather than include full navigation down to the specific neighborhood. That being said, there are many places where street-level information is imperative to the functionality of an interactive map project. 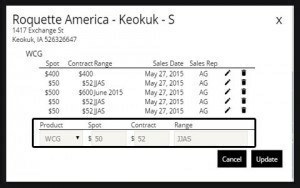 See example: REBATE RENTALS The street information can be displayed initially or the map software can be configured to show the street information within a pop-up box as an optional view for any location. The most common options for street information would be Google Maps and OpenStreetMap, the latter offering several views including topography and MapQuest overlays. A map can work as a great presentation tool. Preset data exports can be created to capture both the visual content on the map and the tabular results below the cartography. This can guide users analyzing the information in a meeting or easily integrated with PowerPoint for an impressive illustration of the map results. In some cases, icons can be numbered to quickly associate locations with tabular results further in the page. If your company works with a specific design and layout, we can pass content first to a dynamic HTML page (see example) and subsequently save the final information as a pdf file. This enables companies to preserve their company design, including custom headers and footers, within all exported material and prints. Creating high-resolution, informative reports with custom online maps has never been easier with export features offered by jQueryMaps. 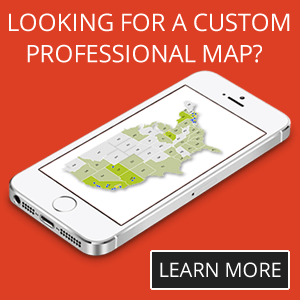 We look forward to assisting you in your next mapping project. Please contact us with any questions or specific requirements for more live examples and a free quote on your project. 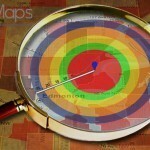 Share the post "Map Software Tools for Clean Water Management and Testing"